A new individual can be created from several points in Causeview, but all individuals will function the same way in Causeview and be saved under the Individuals tab, no matter where they are created. 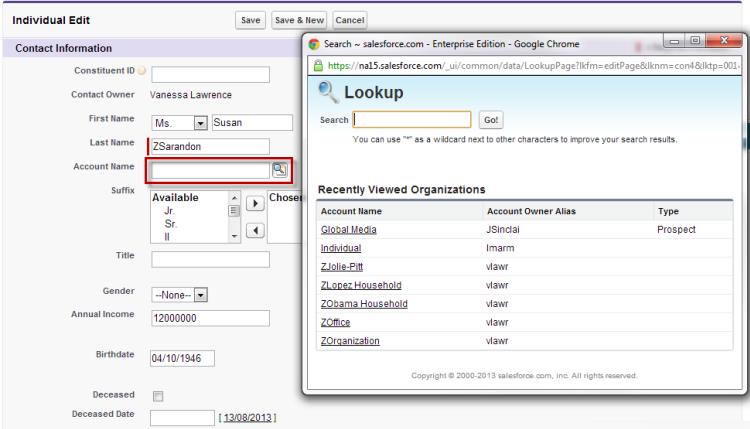 The first step when creating a new individual is always to check if the person exists in Causeview already. This one step is very useful for keeping your information in Causeview clean and manageable. You can search for an individual using the general Causeview search box, on the top of every page in Causeview. As you type in the search box Causeview will attempt to auto-complete your search with information you have recently viewed in the application. This can be helpful if the individual you are searching for is already in Causeview. Clicking on the individual’s name will take you to the detail page for that individual. If Causeview doesn’t suggest an individual in the application, you can search for any records that match the name. It’s a good idea to use the asterisk (*) at the end of a name to search for anything saved in Causeview that begins with that name. If the individual does not already exist in Causeview you can create and save them to the application. There are several ways to create a new individual in Causeview. In some cases you can automatically fill in information that you already have saved in Causeview by creating an individual inside an organization or household. If the individual is an employee of an organization saved in Causeview, creating the individual from the organization’s detail page will set the account for the individual. Find the organization through search or the organization’s tab, open the detail page for the organization, and scroll down to the related list of individuals to find the “New Individual” button. If the individual lives at an address that exists as a household in Causeview you can create the individual from that household. 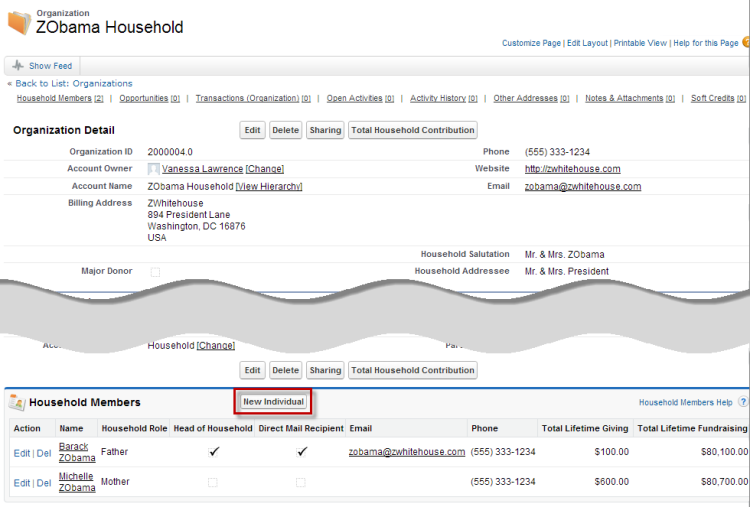 Find the household using search or the households view in the organization tab, and open the detail page for that household. Scroll down to the related list of household members, and click on the “New Individual” button. If the individual does not have any affiliations with an organization or household, or if the organization or household do not exist in Causeview, an individual can be created from the Individuals tab. Simply click on the “Individuals” tab at the top of Causeview and then click on the “New” button. It is also possible to create a new individual using the “Create New” drop down menu, which is available at the left hand side of all pages in Causeview. Simply click on the “Create New” button and choose “Individual” From the drop down menu. The profile for individuals saved in Causeview can contain extensive information, and the new individual form may appear overwhelming at first, but the only absolutely required information is the individual’s last name. While it is best practice to fill out all of the possible information, it isn’t required by the application. Also, some of the information will be automatically filled out as you create gifts and other activities for the individual. 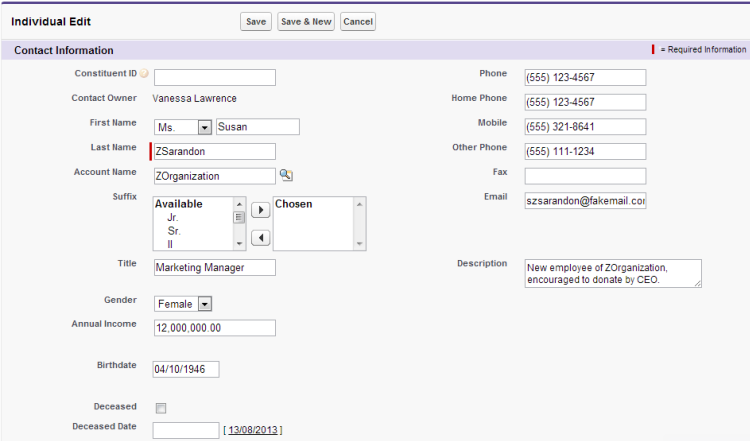 Like all pages in Causeview, best practice is to complete the form in order from top to bottom. The first field on the “Individual Edit” page is “Constituent ID”, which will be automatically created by Causeview when you save. You do not need to enter a value. The “Contact Owner” is also automatically determined and should be set to your Causeview user name. If the organization for the individual’s account is already saved in Causeview, the account can be set using the search tool. 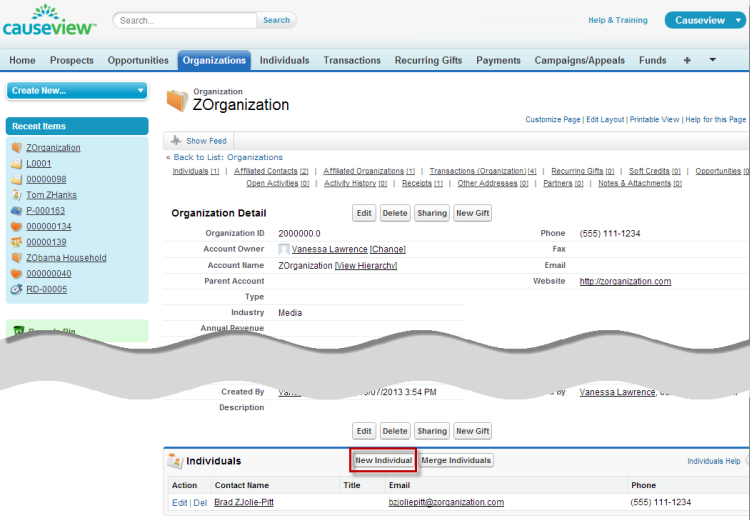 Click on the magnifying glass next to the text box and search through the organizations. Much of the contact information should be straightforward information about the individual’s name, phone number, email, and other personal information. If the individual was created from an organization’s detail page, the phone number will automatically be set to the organization’s number, but this can be changed or removed if necessary. When the contact information is complete some fields may be left blank, but as much information as possible should be filled in. 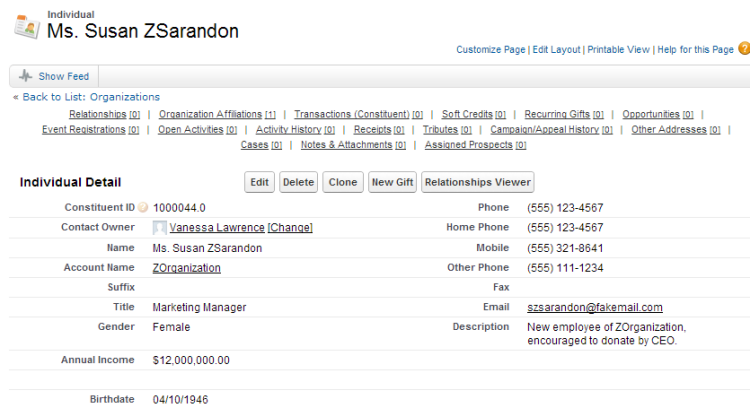 An individual’s engagement profile tracks the constituent’s interactions with your organization. In most cases, this information will be automatically or manually changed over time, and will be left blank when an individual is first saved in Causeview. That means that most of the information in this section can be left blank. One exception is if an individual who has a long history of involvement with your organization is being entered into Causeview for the first time, in which case you can complete as much information as you have available. Another exception is if you would like to give the new individual access to your constituent portal, in which case the “Portal User” box should be checked. The communication profile section is used to keep track of an individual’s preferences for solicitation and communication. If the individual prefers to remain anonymous in their contributions this can be specified in the communication profile. Solicitation codes can help you to track when the individual should be contacted, and trade status marks whether the individual’s contact information is available to trade. Subscription to newsletters or annual reports can be marked using the available checkboxes. If a household exists for the individual, you can choose to use the salutation and addressee associated with that household in all communication, or you can enter prefered values in these fields. If no preferences are specified the salutation and addressee will be determined based on the individual’s name. If automatic householding is enabled, a household will be created when the individual is saved, and the individual’s salutation and addressee information will be saved into the household. The “Use Household Salutation & Addressee” box will be automatically checked for the individual, and any changes to the household information will impact communication with that person. 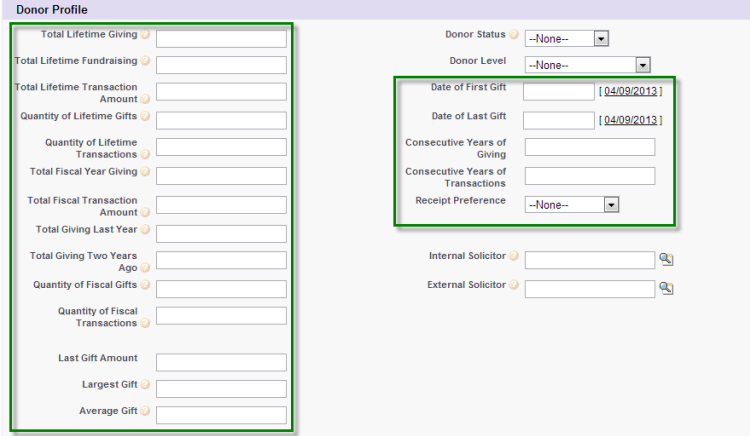 The donor profile is where information about accumulated giving and transactions exists. The values for giving and transaction totals will automatically accumulate over time, and should not be entered manually. If the individual has a giving history prior to being saved in Causeview, it should be saved into the application through a data transfer from a previous system or entered manually. The fields marked in green should be left blank. Causeview will fill in these fields with information as it accumulates in the application. The donor status and donor level menus allow you to better track an individual’s involvement level with your organization. 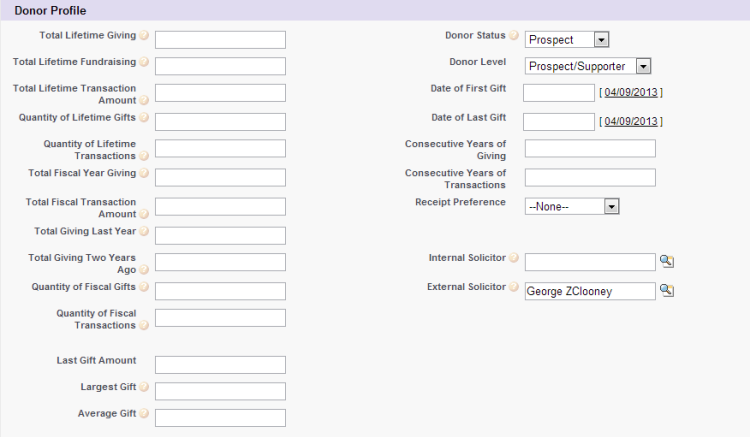 Customized donor levels allow you to group your constituents according to your organization’s needs. The internal and external solicitor fields allow you to record a Causeview user or another individual who encouraged or convinced this person to become a constituent. The stewardship profile for an individual allows you to track interactions with the constituent and determine when further contact is needed. When creating a new individual in Causeview this section will usually remain blank, as you will usually not have any activity to save. This text box is available for additional notes and information related to the individual. Address information in Causeview can originate with an organization, household, or individual, and can be shared between these entities. By default an individual can have two different addresses. If an account is specified for an individual the account’s address information will be part of the individual’s details. This address will usually represent a work address. You may wish to copy the work address to the “Other Address” field and enter a home address for the individual, by clicking on the “Copy Mailing Address to Other Address” link. This is particularly useful if authouseholding is enabled, as a newly created household for the individual will inherit the saved main address. If an individual’s household is created before the individual, you can check the “Use Household Address & Phone Number” box to copy address information into the individual’s details. If automatic householding is enabled, a household will be created when the individual is saved, and the individual’s address and phone information will be saved into the household. The “Use Household Address & Phone Number” box will be automatically checked for the individual, and any changes to the household information will impact communication with that person. An individual’s association with a household can be specified during creation if the household already exists. You can spFecify the individual’s role in the household, as well as indicate if they are the head of the household or a direct mail recipient. There should only be one head of each household. In most cases only one member of each household will receive direct mail. The additional information section allows you to save information about the individual’s work relations and languages. Once all of the individual’s information is entered, you can save to Causeview. Causeview will move to the individual’s detail page, where you can review the information you have entered. From your new individual’s detail page you can edit the individual you have created to add a household or account, if you didn’t enter one during creation. You can also add new relationships and affiliations to connect the individual to your other constituents, set up automatic soft credits, set a task or calendar event to contact the individual, or create a new gift from the individual.